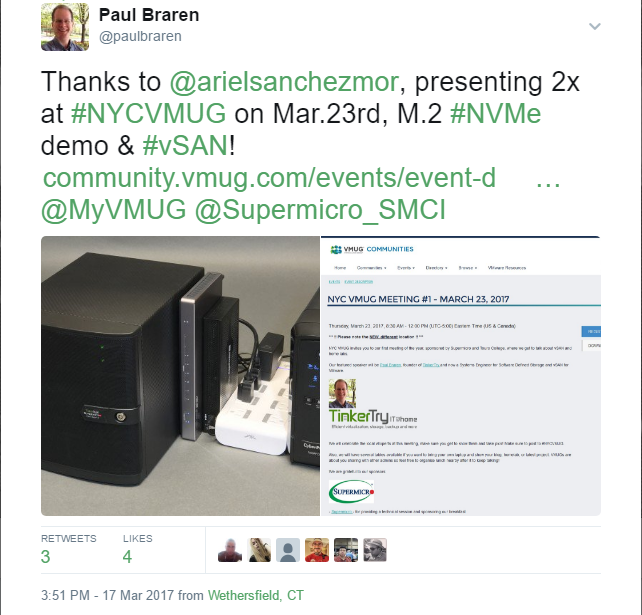 My experience demoing Xeon D home lab and talking NVMe and vSAN with Supermicro at the recent NYC VMUG, thank you Ariel Sanchez, and welcome to VMware! 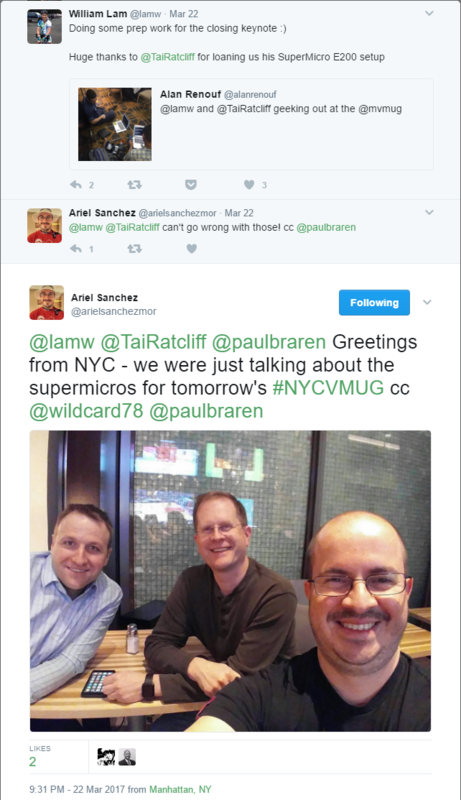 Thanks to the the extreme hospitality of NYC VMUG Leader Ariel, I was able to enjoy a wonderful dinner with a friend right in NYC, the night before last week's VMUG. 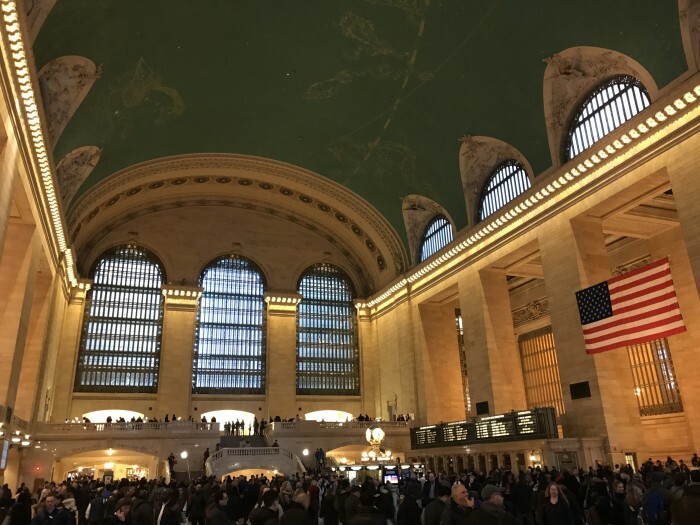 Turns out that temperatures in mid 30s (Fahrenheit), coupled with 20-30 mph sustained winds makes cabs, Uber, and Lyft rides from Grand Central rather scarce. 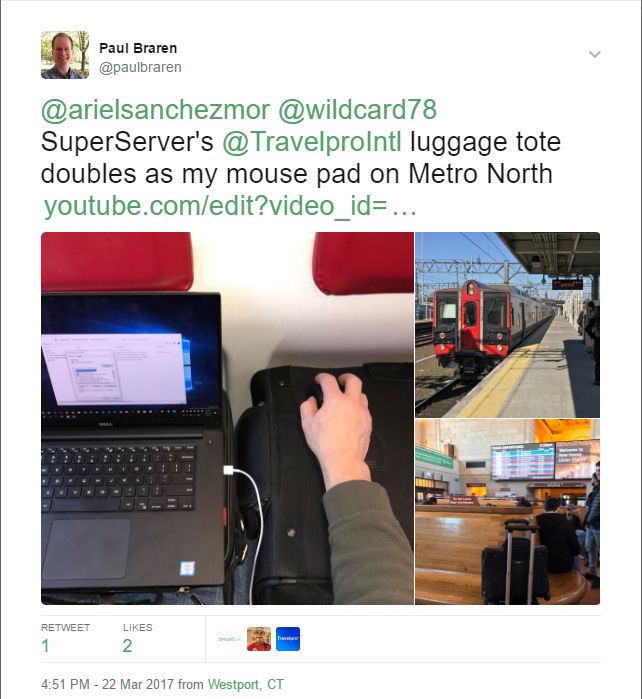 Since I had taken the Metro North train in from New Haven, I decided to walk to the restaurant instead, toting my home datacenter and luggage along with me, over curbs and potholes for about a mile. Good thing I had no 3.5" spinning HDDs with me, as my SuperServer had a pretty rough journey. Bad thing that I had no gloves. After our warm and wonderful meal and conversation together, it got better. Despite my whining about having to finish my TinkerTry and VMware PowerPoint decks back in my hotel room, one of the other leaders that I've known for years, Mike Martino, was able to join Ariel and I for a bit back at my hotel lobby. 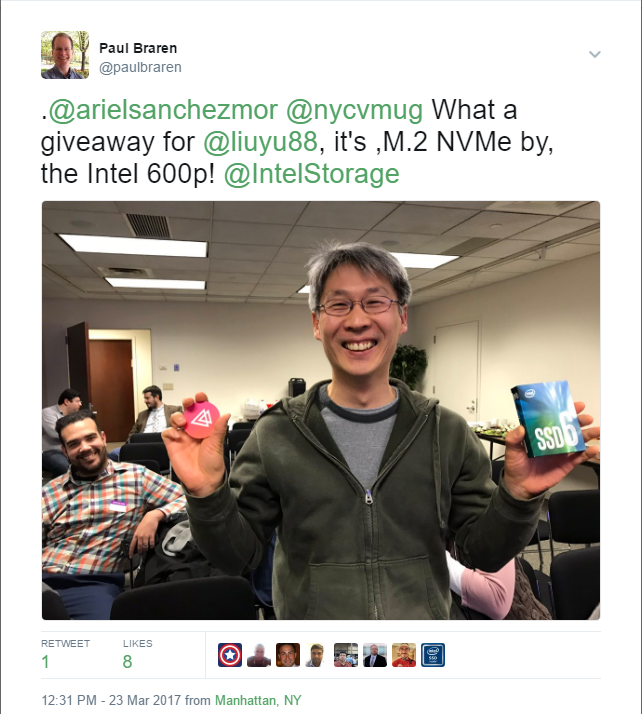 We got to talking about home labs, and his very own TinkerTry'd Supermicro SuperServer Bundle 2 ownership experience. 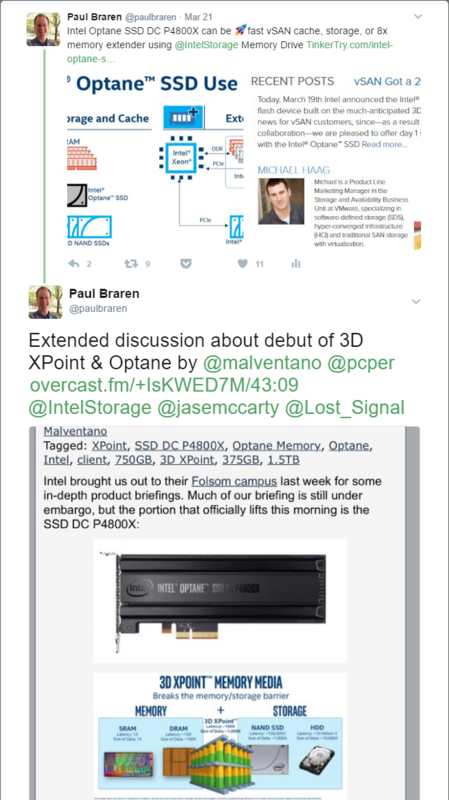 We even got to nerd out about vSAN ideas for that 4 way Amfeltec M.2 to PCIe adapter, which he actually invested in as well. Awesome! So that polish on the PowerPoint could wait. 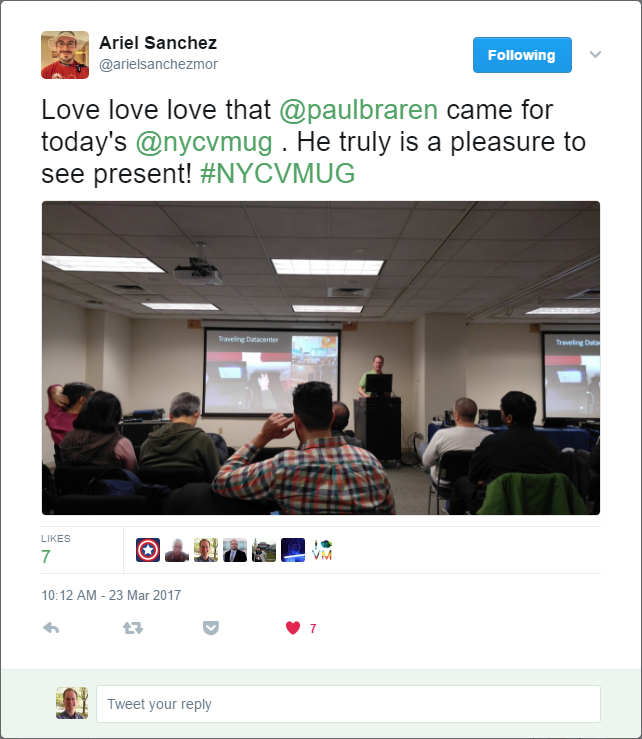 Times together like this are one of the big values in the VMUG presentation experience. It's the incredible leadership and hospitality of folks like Ariel and Mike that make all the difference. Who said New Yorkers weren't friendly? 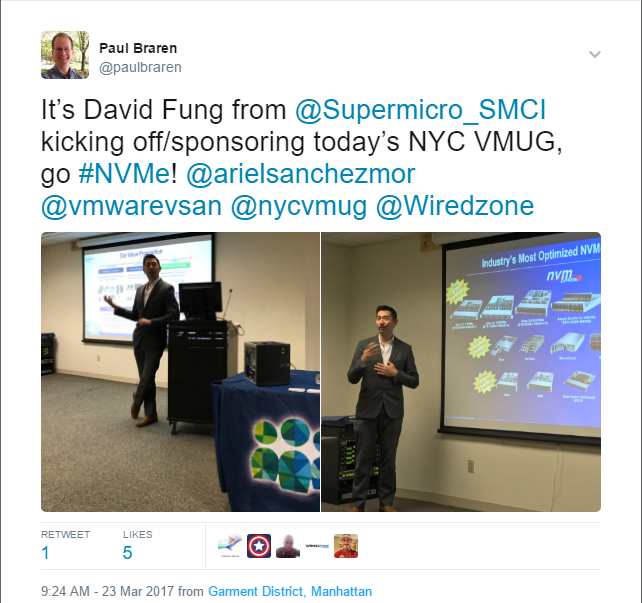 Finished the decks, slept for a bit, then next morning bright and early I was off to the VMUG at Touro College, who provided the use of their large meeting room. I was greeted by more friendly people there to help out with set up, and a nice hot breakfast awaiting everybody. Great way to start the day! After years of being a participant, I asked to become a leader, and Mike Martino accepted me in NYC. 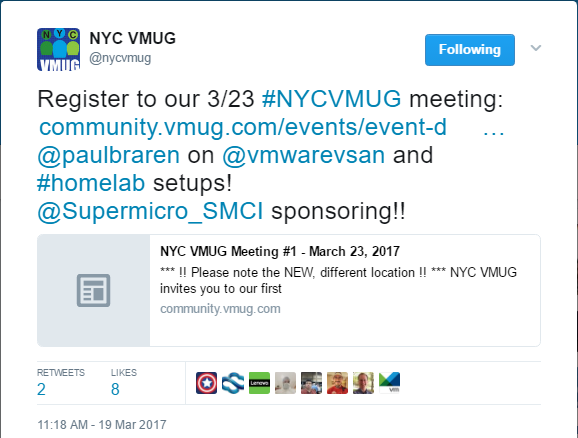 You can see stuff we do at nycvmug.blogspot.com for ideas (and every VMUG has their own ideas) so your focus should be on what you can do for your local one. And if going to an event is difficult, save a PTO day and at least go to the UserCon – these are one day mega events which you just can’t miss! 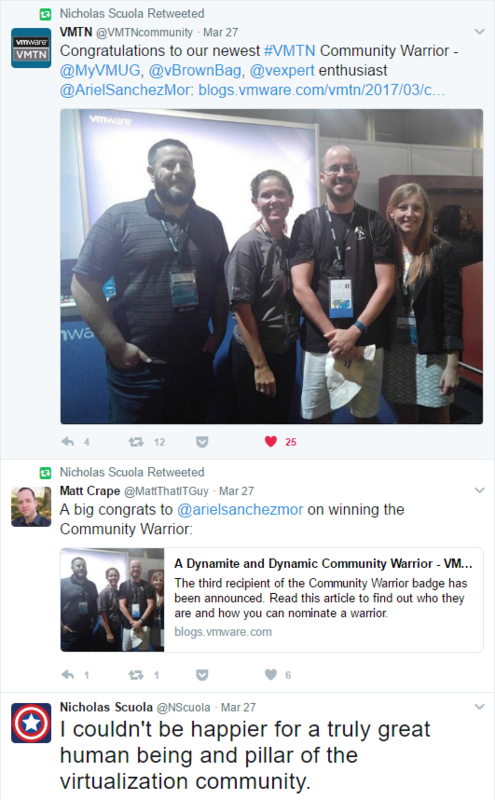 On the VMware Communities Roundtable episode 383, Ariel's new "Community Warrior" status was also acknowledged, right at this spot in the podcast. Perusing the pics below, do we look like we're having fun? Heck yeah. 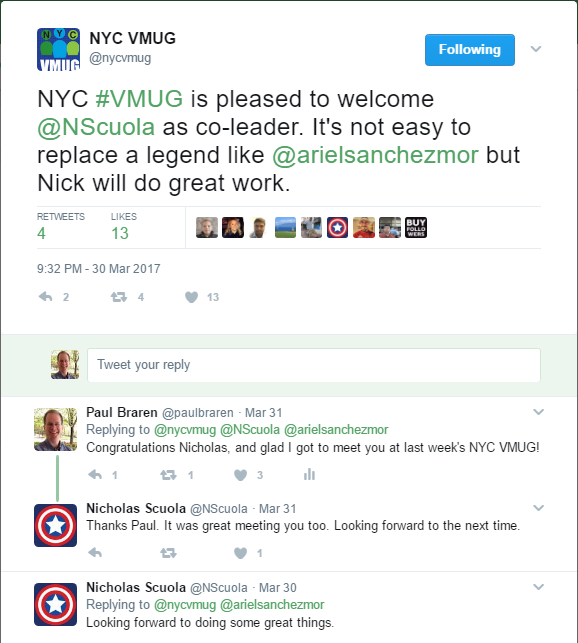 NYC VMUGers are the friendliest, thanks in no small part for Ariel setting the upbeat tone, fostering a friendly help-each-other atmosphere. 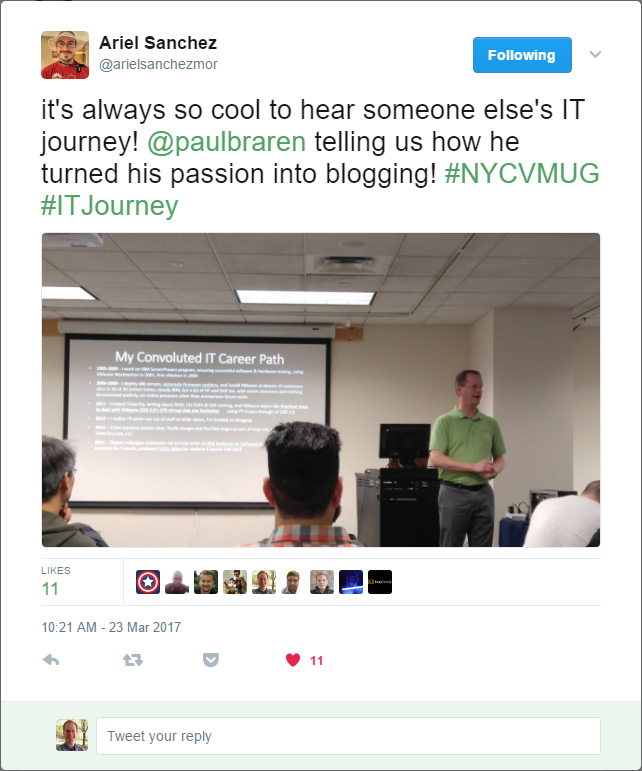 Such VMUG experiences are just a great experience for me personally. One of the many perks of public speaking is the highly involved and interested audience . The immediate feedback, and the new ideas their questions foster, make it so much fun and worthwhile. 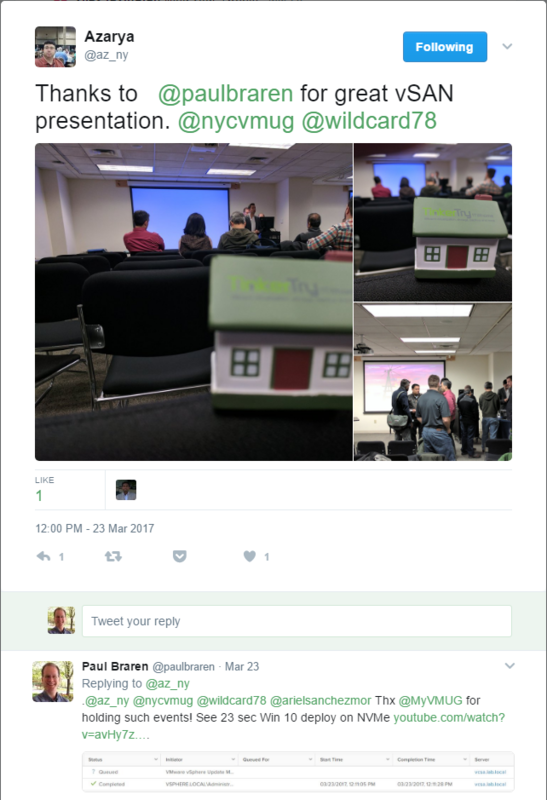 Everybody is there not just to hear the presenters, but to learn new things from one another. 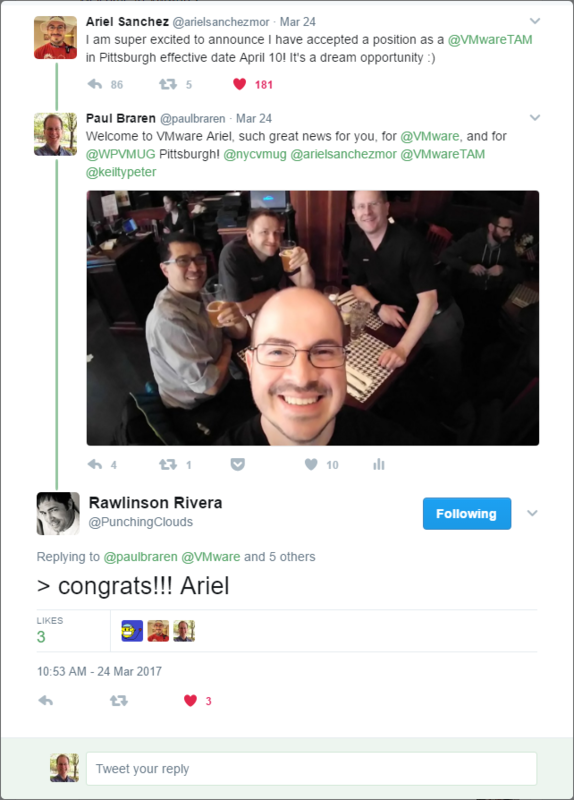 Am I proud and happy to learn that Ariel is joining VMware as a TAM next month! I can't wait to see what he's able to do in this new chapter of his career. 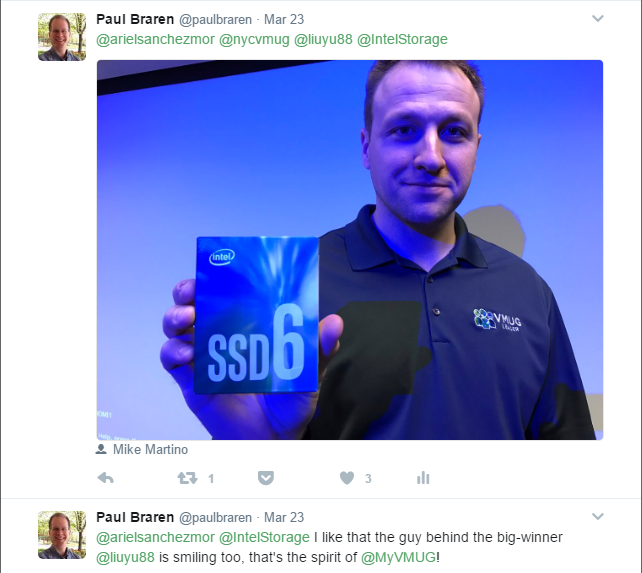 From home lab tinkering to a vSAN career: the TinkerTry journey. VMware vSAN in your company: how it works, and how vSAN Ready Nodes or VxRail can accelerate infrastructure deployment.